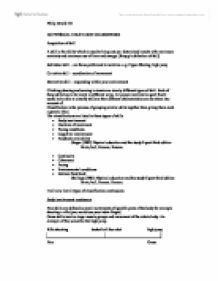 AS PHYSICAL EDUCTAION COURSEWORK Acquisition of skill A skill is the ability which is used to bring out pre-determined results with maximum certainty and minimum use of time and energy. (Knapp's definition of skill) Individual skill - are those performed in isolation. e.g. Figure Skating, high jump Co-active skill - coordination of movement Interactive skill - responding within your environment Climbing dancing and serving in tennis are clearly different types of skill. Each of these skills has to be learnt in different ways. All people involved in sport find it useful to be able to classify skills so that different characteristics can be taken into account of. Classification is the process of grouping similar skills together then giving them each a generic label. 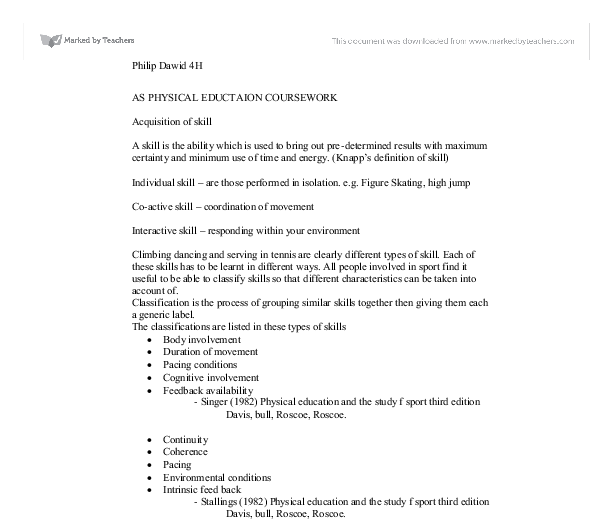 The classifications are listed in these types of skills * Body involvement * Duration of movement * Pacing conditions * Cognitive involvement * Feedback availability - Singer (1982) Physical education and the study f sport third edition Davis, bull, Roscoe, Roscoe. * Continuity * Coherence * Pacing * Environmental conditions * Intrinsic feed back - Stallings (1982) Physical education and the study f sport third edition Davis, bull, Roscoe, Roscoe. ...read more. - internal and external paced skills Self-paced skills- the performer controls the rate at which the skill is executed. These skills are usually closed skills, for example javelin throw, discus Externally paced skills - are the surroundings. These surroundings could include opponents, controls the rate of performing the skill. The performer must pay attention to external events in order to control his or her rate of movement. These skills involve reaction, and are usually open skills, for example in ball games the performer must time his actions with the actions of other players and the ball. For example, taking a corner in football, the players in the box would need to time their runs perfectly to connect to the ball with their head and score the goal. Self-Paced Externally paced Discus Heading a ball(football) Individual coactive Interactive Self Paced Discus throw Serving (tennis) Corner kick (football) Externally Paced Dodging a punch (boxing) Receiving a serve (tennis) Penalty save (football) The organization continuum This table puts into category which skills need a high organization or a low organization. High organized skills are skills that need planning for example tactics in a football match; this is so everyone knows what they need to do. ...read more. I would explain the basic principles of the forehand drive for example the shifting of weight as you swing the racket to give optimum force on the ball. To keep a high level of intrinsic and extrinsic motivation I would play games to improve his technique, this should keep him interested. The interactive skill I would use is a pass in football. Now I would expect the novice to have sum prelimory experience of kicking a football as this is the most popular sport in the world. I would give him target to hit and maybe I would pose as a moving target for him to predict my moment and pass the ball in front of me. This is the most difficult passing skill along the floor. For intrinsic and extrinsic motivation I would let him take penalties against me for fun or f there was a group of people I would have a game and see if they will apply what they have learned in the game. Conclusion For any training technique to work you need to remember the following table. I hope that in my report I have proven that classification helps you to break down training skills and help to determine what techniques you need to improve them. ...read more. aspect of fitness, such as agility, balance and co-ordination Health-Related Fitness Tests Multi Stage Fitness Test - test for stamina Introduction This test is very good for games players as it is specific to the nature of the sport but, due to the short turns, is perhaps not suitable for rowers, runners or cyclists. near the anklebone, not with the front of your foot), lock your ankle on impact with toes pulled up (so your toes are about the same distance off the ground as your heel), strike the ball in the middle (about 5" above the ground) and follow through toward the target. Physiological * She will lose weight. * With an increase in speed my performer will be able to make it quicker to the shuttle to receive a shot. * The performer will be quicker to the shuttle, which may lead to more points being scored, therefore improving her game. The aspect of fitness is strength because I was putting a high intensity in it for a little while. If the time was longer and the intensity was lower than it would have been stamina not strength. The principle of training I chose was overload because the activity was going to be focused on my strength. leg extension ? leg press ? shoulder press ? dumbbells ? maximum number of press ups ? maximum number of chin ups ? and how much I weigh. I will be repeating this session at a later stage of my programme to see if I am improving. Results are on the next page. The reason for this is mostly based on confidence in striking the ball as some of the time a shot can be seen as a firm pass into a directed are which is no different to how you?d pass to someone in a game.